MEXICO HAS ESTABLISHED THE LARGEST MARINE PARK in North America, a 58,000-square-mile region of the Pacific Ocean several hundred miles off its southwestern coast. “UNIQUELY RICH” The Revillagigedo Archipelago National Park surrounds four uninhabited volcanic islands and is described as uniquely rich in marine biodiversity, supporting several species of sea turtles, three dozen species of sharks and rays and more than 360 species of fishes, some of which are not found anywhere else in the world. COLLIDING CURRENTS The undersea dynamics of the region – in which the cold waters of the California current converge with the warm waters of the North Equatorial current to create upwellings that ensure an abundance of nutrients in the waters – also attracts migrating animals above and below, including seabirds, dolphins, whales, tunas and sharks. Humpback whales spend winter months in the area, according to a Report by the Pew Bertarelli Ocean Legacy Project, which provided government and other organizations technical and scientific support for creation of the reserve. UNESCO WORLD HERITAGE SITE The archipelago – encompassing four islands, Socorro, Clarión, San Benedicto, and Roca Partida – and its waters were recognized by UNESCO as a World Heritage Site in 2016. 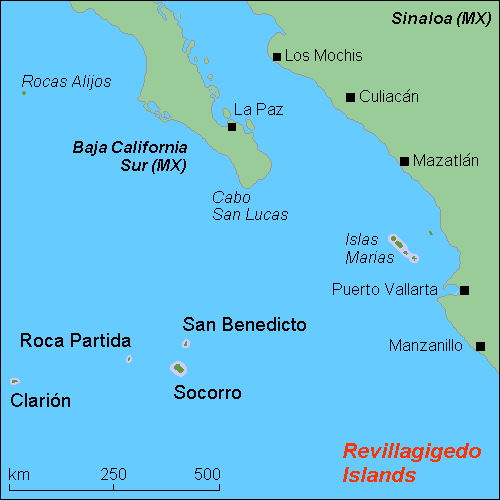 Mexican President Enrique Peña Nieto signed the decree creating the Revillagigedo Archipelago National Park on November 24th, as reported in the online magazine LiveScience.